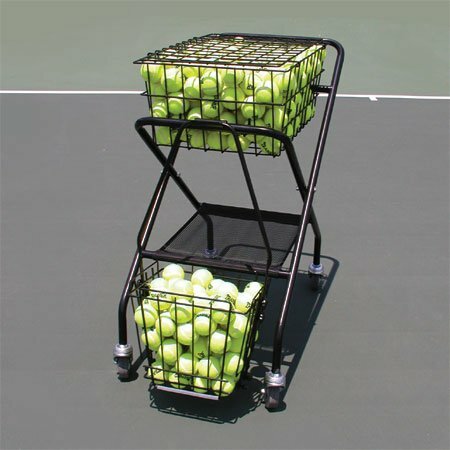 Our Coach's Tennis Ball Cart sets the industry standard for full-sized traveling carts for coaches or tennis parents. High-quality 4" rubber wheels with sealed ball-bearings. Easy to roll. 250 tennis ball capacity Powder-coated frame with vinyl-coated heavy gauge basket. Convenient ball basket hanger (basket not included). Comes assembled. Just screw the wheels into the legs. Weighs only 22lbs without balls. Fits easily into most cars (54"folded length). Lockable lid now more sturdy and secure. (Padlock not included). Deluxe nylon tray for training aids, extra racquets, etc. All carts now include removable Mesh Divider to easily organize transition balls for QuickStart Tennis. Extra Mesh Divider Nets can also be purchased separately. INDUSTRY STANDARD: Our Tennis Ball Cart Sets the Industry Standard for Full-Sized Traveling Carts for Coaches or Tennis Parents. EASY TRANSPORTATION: Easy to Roll Around Any Court. 250 Tennis Ball Capacity. Fits Easily into Most Cars (54" Folded Length). STURDY FRAME: Powder-Coated Frame with Vinyl-Coated Heavy Gauge Basket. High-Quality 4" Rubber Wheels with Sealed Ball-Bearings. REMOVABLE MESH DIVIDER: All Carts Now Include Removable Mesh Divider to Easily Organize Transition Balls for Quickstart Tennis. NO ASSEMBLY REQUIRED: Comes Assembled. Just Screw the Wheels into The Legs. If you have any questions about this product by Oncourt Offcourt, contact us by completing and submitting the form below. If you are looking for a specif part number, please include it with your message.